What is Banana fibre project? Banana fibre project is a process of extracting fibre from the Banana tree which is a waste material after harvesting the Banana. Why for Banana fibre project? Actually Banana is a gigantic herb, and a food fruit crop an ancient species cultivated all over the world. Next to Brazil India is the largest banana producer. The fruit bunches and leaves are main source of Income, besides the leaves are used as bio plates for serving food in homes and functions. Banana fruit contains of multi vitamin and proteins, other portions of Banana plant are dumped as waste, and the fruit bunches (the upper side ‘U’ type stem) is also cutted and wasted. Farmers often face problems to clear it, Due to weather conditions such as floods, a heavy wind, the complete Banana trees falls down, and creates a heave loss and more over the price fluxations for Banana fruits. Due to these factors Banana farmers are suffered to such kind of difficulties. So, apart from these all there is a solution. Which the Banana trees can be extracted and converted as a fibre, through simple Machinery. This process will be done only after harvesting the Banana. In India we have about 5 lakh hectares of Banana cultivation only 10% of the Banana waste is extracted as fibre. Mostly the fibre is extracted by manual process and the yield of fibre is very low and this kind of manual process needs skilled labours. After a brief study of Banana fibre extraction. Eco green unit developed a Banana fibre extracting Machine, Which can be easily operated, by an unskilled labour, and gives maximum output. The stems are cutted and divided into pieces, and inserted into the machine and extracted as fibre. How the fibre is stored and packed? After getting the fibre from the machinery, it should be beaten in the stone beds, and squeezed, and it should be combed without pith content and should be 100% dried and packed, by air tight Polythene Bags. 1. Machinery is developed by German technology, with 1 H.P. single phase motor. 2. Easy to Mobilize (Portable) 3. Ladies can operate, less maintenance, and safe to operate. 4. User friendly & Economic. 5. Clean work atmosphere. 6. Fifty times increase in fibre production compared to manual process. 7. Superior quality fibre in terms of length, softness and colour. How many persons to operate the Machinery? 2 Persons (Ladies). One is to cut the trees into pieces and another person is to operate the machinery. What is the space requirement needed? Who can go for this Industry? 1. Banana cultivating farmers (Rs.2,500/- extra income per acre is assured) 2. Self help Groups 3. Entrepreneurs. Is this project can be done in urban sectors? Yes certainly, this project can be done in urban areas, the fruit bunches (‘U’ type stems) can be collected in vegetable markets, which is plenty and dumped as waste. What are the usages of Banana fibre? The banana fibre is extensively used as a blending material in textile industry. 2. Banana fibre is used in Pulp industry. 3. 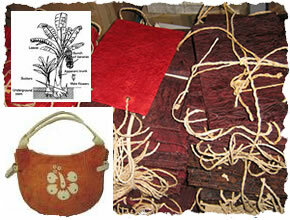 A wide range of Handicrafts are made in Banana fibre. A vast market is in the countries of U.S and Europe. Eco green unit has a marketing Tie-up with the entrepreneurs to those whom we have supplied the machinery. Our requirement is 3,200 tons per Annum. This can be done only by promoting this project country-wide mode. We target this project as a community based development programme, rural upliftment and a wealth from waste concept. We have a tie-up with state governments in India. The project promotion is done through Agricultural Department, Women Development, Rural Development Authorities, NGO’s, Farmers associations and with individuals.